Talk about the best breweries in Bangalore and Toit is sure to make it to the list. Started in 2010 by a group of 4 vibrant entrepreneurs, Toit was a childhood dream come true for them. With the aim to serve the best Ale in town, these 4 have now managed to get the whole town talking. With its variety of beers, sumptuous food, lovely music and its perfect location (100 feet road), Toit is undoubtedly one of the most visited breweries in Bangalore. In a business such as Toit’s, handling customer calls is an imperative part of the day to day business. And efficiency is an even bigger part of this. Customer support is an imperative part of Toit’s business. Helping customers even before they enter the brewery can make the customer’s experience a delightful one. This means, helping customers right from reservations to giving directions and a whole lot more. When Toit started out, their phones were ringing off the hook. These were mostly calls for reservations and queries. While queries were not an issue, reservations required a lot of back and forth. Maintaining a record book & personally calling customers proved to be time-consuming. Due to this, they missed a lot of calls. Instead of installing more phone lines & to make the process of reservations easier, Toit’s owners decided to use a web-based solution. They began using Exotel for all incoming & outgoing calls. This saved them a considerable amount of time. – Customers also received an SMS when their call was missed. This helps keep customers informed about their call being received. The employees at Toit found themselves giving customers directions to Toit, multiple times a day. Giving directions to customers manually not only becomes a repetitive task but also a tedious one. Therefore, Toit’s employees needed a solution that would help save their time & effort. To make this process easier & less time consuming, Toit set up an IVR solution using Exotel. Clients could get directions to Toit depending on where they were coming from. 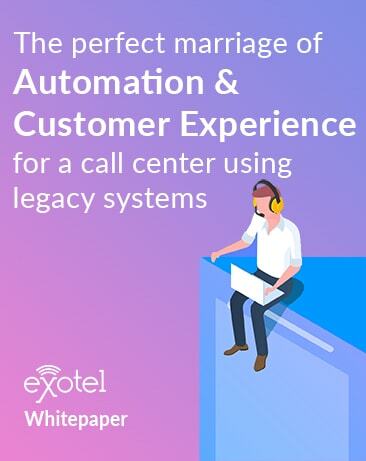 Exotel’s system has helped automate processes that would otherwise have been laborious tasks. It has helped our staff focus on other activities. Normally, the Toit host had to call people who were 2nd or 3rd on the waiting list to check if they needed a table. This process was rather long and time-consuming. To avoid the hassle of manually calling people, Toit needed a solution. Toit integrated Exotel with InResto to automatically dial the numbers of the clients on the waiting list. They used Exotel’s IVR solution to get responses directly from the clients. The host at Toit did not have to manually call each person, thus saving time and avoiding confusion. Toit gets a call back to their system with the response. The clients that wanted to be removed from the waiting list can now easily be taken off the list. In the future, Toit aims to automate the entire reservation process using Exotel and InResto. All reservations will directly come into the system, without any employee having to manually note down reservations.